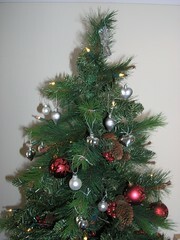 Here's wishing family, friends and all my readers a very merry Christmas, wherever you may be. Thanks to everyone for their cards, emails and messages of goodwill. When I first put my gazebo up, I was asked when the party was. Now the party is very much over, as you can see. The demise of the gazebo was inevitable. In fact I'm amazed it's survived as long as it has. I have been doing progressively more and more running repairs on the poor thing, but it's finally got to the point of no return. With some creative welding, and a new cover, the gazebo's life could be extended, but I'm not sure it's worth it. With it gone,Lady Jane suddenly looks very different. See the lone fisherman in his open boat there? Seems like even the freezing cold will not deter this hardy fisherman. I've been Ice Fishing on Devil's Lake, North Dakota. At least there the friendly banter, copious amounts of alcohol and a warm truck, or ice house, not too far away help keep spirits high, so to speak. I hope he at least caught a reasonable sized fish for his efforts. An extra second - what will you do with it? I read this article, and thought 'what an odd time to add an extra second'. I then realised it was a US article and that there was no mention of UTC, or GMT as it used to be. Of course that extra second is really tacked onto the very end of 2008, UTC time, extending what has been a miserable year by anyone's standards. I'll probably save the extra second, like I try to save the extra daylight savings hour we get every year, and use if for a bit longer in bed on the next Monday morning. I love it when it's crisp & cold like this. The whole world changes into a winter wonderland overnight. It was quite warm standing there in the morning sunlight, despite the frost, getting that all important first cup of tea inside me. Moving into the, slight, wind and shade was a different matter entirely though. When I bought the radio, the guy at the shop said I should buy the biggest speakers I could. When I then looked at the really big speakers, he said that I would also need an amplifier to drive those. Looking at the prices of the less big one's, I settled on these as a compromise - The biggest I could get for my money. The wood there will need varnishing, at least, so it blends in a little better with the rest of the woodwork in the wheelhouse. Still, I'm very happy with the sound from these speakers. It's akin to the quality of sound you first experience when hearing an MP3 played through good earbuds. So here's another of my 'I should have done this month's ago' moments. I unexpectedly received a few hundred quid the other day, so immediately thought 'It's time to get that radio I've been thinking of all these months'. The last radio I bought was not a huge success, mostly due to the hassle of powering the thing. For some reason it really chewed through batteries, and recharging them just did not work out. The damn things were always discharged when I wanted the radio on, and I had to recharge them in two separate lots, as the radio took six batteries and the charger four! Using it on mains did not work out either, mainly on account of the frequent power interruptions switching between the generator and the inverter. The idea of getting a car radio was largely inspired by seeing the success that Rick's satellite radio was on the Wanderbird. I was after a car radio a with remote control and the ability to play music from a USB port. 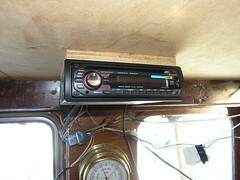 Happily this new radio does both, though quite why anyone would need a remote control for a car radio escapes me. All in, including the aerial and speakers, the whole lot came to just five pence short of the few hundred quid I received. After connecting it all up and hearing the quality of the sound, there is no doubt in my mind that it was well worth it. Just got to finish the installation off, including a neat housing for the radio and tidying those unruly wires away before Andy sees them. It's a bit of a blurry picture, I know. Maybe time for a new camera???? 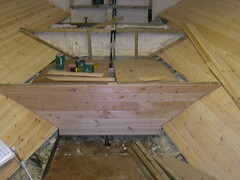 Anyway, here you see the first of the tiers of pine cladding going in at the back of the stern accommodation area. Not long now & it will all be done. Most of the time was spent working out just how I was going to do it, then building the supports for the cladding to go onto. You can see the supports for the next tier in place there. The cladding down below is not finished yet. I've still got these tricky bits to go with the pine tongue & groove. Not the hardest thing done here, but not completely straightforward either. Sometimes this seems like a never ending task. Gale force winds and rain. 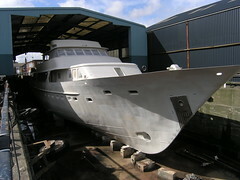 Obviously not much has happened, work wise, on Lady Jane as a result! Now it's fast approaching winter, and the weather has gone into a steady decline, it's time to continue the good work down below. 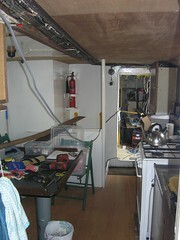 On odd days, when it's been miserable, I've been doing some stuff in the stern accommodation space. Not much. Now it's time to see if I can get this space finished off at last. At least in terms of the overall shell. After reading posts elsewhere, looking at pictures of other boats and thinking it through, I'll probably paint the wood white instead of varnishing it. The varnish would probably make the place darker and less appealing. A few weeks ago, I took this picture of the Arklow Rebel as she slipped past Lady Jane. 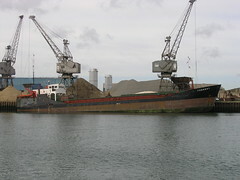 On her way to who knows where, with a load of scrap steel from the yard further up the river. What always amazes me about these huge boats is how little noise they make, at what must be a relatively slow speed for them, as they cruise on down the river. Look at how calm and bright it is in the picture - nothing like that now. The other week I posted about the Sand Serin listing, now it's Torrent's turn. 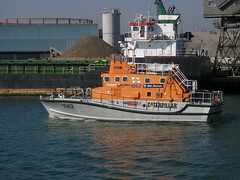 Torrent is a regular visitor to the wharf immediately opposite Lady Jane, she brings cargos of sand. 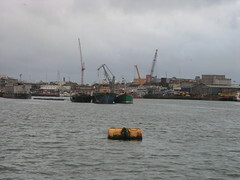 Not dredged, but sand from elsewhere, which the cranes in the background offload one bucket load at a time. Anyway, look at torrent's bow - it's completely out of the water there. I've never seen that before, so I suppose an uncomfortable night for that crew as well. I had read, on the Internet though can't find the article again, of a ship that had lost it's propeller mid Atlantic sometime in the early 1900's. 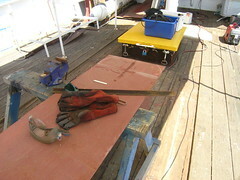 The crew made a new propeller in the on-board workshop and by flooding the bow so the stern was out of the water, managed to fit the replacement one and so continue the voyage to England. 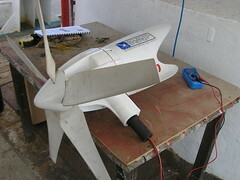 If I remember correctly, the makeshift propeller is still displayed in some museum in the north of England. 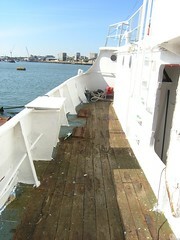 The ruddy/brown patches are evidence of progress on the 'filling in the holes on the starboard side' project. The replacement scupper was just one part of this much bigger project. 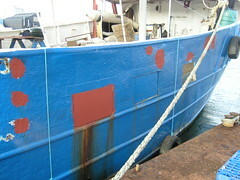 When we originally painted the starboard side, I had simply filled any 'rusted through' holes over with duck tape. Now it's time to fix all that properly, else the underlying problem will just get progressively worse. The port side, I hasten to add, has no holes where they shouldn't be. I'm learning that welding and wet really do not get along! Really windy weather is not good to weld in either. Definitely a job for the dry, calmer, days. 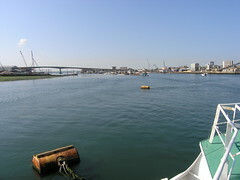 A short way down the river from me is a Cemex yard, just by St Mary's, home of The Saints, Southampton's football team. The Cemex yard has dredgers coming and going at all hours, day and night. 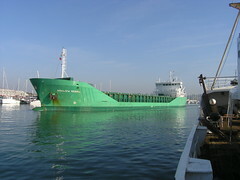 Often discharging their cargo, a very noisy process which takes hours, at some ungodly hour. Anyway the other night a dredger, the Sand Serin who is a regular there, ended up listing really heavily to starboard for some reason. You can just make her out as she leans over in the picture there. I was half expecting to hear the crack of her mooring lines parting as the tide went out, followed by a huge splash as she went over. All was fine though. I suspect the only real problem was an uncomfortable night's sleep for the crew. Here you see me positioning a newly made scupper, ready for welding into place. This is one of two scuppers I'm replacing completely, as the previous incarnations are rusted beyond any hope of repair. 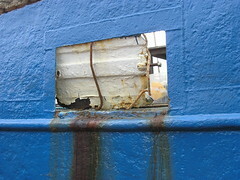 Fred will be well pleased to read this, as he has long disliked the streaky rust effect these have had on the beautiful blue paint job on the outside of the hull. This has been more learning, but fun to do. 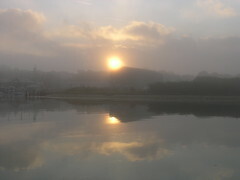 We have had a series of misty or foggy mornings recently. Everything is so calm and still. It's wonderful after the battering the weather has been giving us recently. 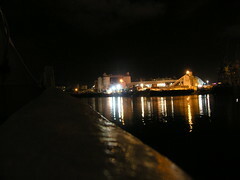 At one point during the night, I could hardly make out Lady Jane's bow from the wheelhouse. Thick fog like that obviously makes it tough for everybody working out on the water. 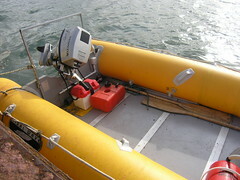 Ever wanted to own a lifeboat? It looks like you might just be a little too late to own Edith Emilie. 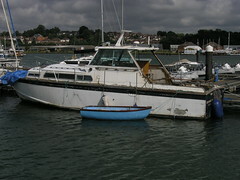 There I was thinking they only took her out for a run up and down the Itchen as a way of advertising her. It's a lovely looking vessel, though I would not want her fuel bill. The newly repaired, and painted, platform has now been launched - some six months after it was damaged. A perfect day for it, as you can see. Finally, after all this time, I've now been able to get a much needed thousand odd litres of fresh water into Lady Jane's water tank, courtesy of the platform. Now there is no excuse for not getting on with work over the side again. Friday night, at 8.19 according to the log, I finally managed to start the generator by clicking a button on my PC. More importantly, it shut down correctly afterwards - And I could repeat the cycle. Now, when the voltage hits a certain point, the generator can automatically kick in, run for a specified time, then shut off again. The process checks the oil light is on after turning the fuel pump on, then checks it is off after the starter motor has run for a specified time. If not, there is obviously something wrong. In the end it was surprisingly easy to do, a bit of a steep learning curve though. I used a Phidget 888 interface card and their Precision Voltage Sensor, a few small relays (electronic switches), one big relay for the starter and a bit of programming to pull the whole thing together. It all looks a bit temporary at the moment, that's because it is. 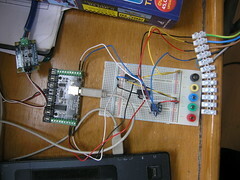 The white board you see is a breadboard, where you can push wires and components into a board, rather than using solder. I discovered quite quickly that it was a mistake to solder (sodder for you guys in the US) everything in place while learning about the various relays and wiring configurations. I killed a few small relays in the process, and also bought a few that were too tough for the interface kit to switch with it's 5V, low current, output. Next will be to install a kind of master relay, mostly because of the way I've wired the oil and fuel warning lights, finish off the programming, do more testing, solder everything onto a proper board then mount the lot into a robust container. Oh, and I also need to plumb in and label the control cable and house the generator in a weatherproof place. When the concept of starting the generator remotely, based on low battery voltage, was first mooted, it just seemed like such an impossible task. Now, it's a reality. With the automatic generator startup, along with the automatic switch Andy installed, that generator simply becomes an extension of my battery bank for all the boat's power requirements. After a long delay, and more money than I'd have liked, the Old Sow finally has her original engine back. The impeller has been replaced, the cooling water tubes cleaned out and the engine given a good servicing. That 15 HP Honda pushes the sow along at a good clip now, getting up on the plane with no problem at all. What I found was that the engine is probably a little heavy for the boat, so a lump or two of ballast has been pressed into service up forwards. With the ballast in, the Old Sow is also much more controllable than it first was. The only down side, so far as I can see at the moment, is that fuel consumption will inevitably go up. I'm still on the same tank of fuel from when I switched the 4 HP engine in, at the beginning of July. Ok, so maybe a bit of poetic licence with the whitecaps there. It's been yet another in this series of miserable weekends we've had to endure in the UK recently which, in turn, slows down work on Lady Jane. I thought 'I usually only take pictures on bright days, and not so much on miserable days'. 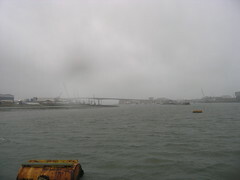 So this is to adjust that balance slightly, just to give you an idea of how grey the river gets when it's like this. Here's another trace, showing my battery bank voltage over time. Much more lively than the last one. The morning starts off at a fairly low voltage, after a dead calm day and night previously, and as the wind picks up during the day, so the voltage jerks it's way upwards on wind power. The big trough at lunchtime shows the effect on the battery of the water being heated by the central heating system. That big drop, at about four thirty is the water pump - topping off the main engine fresh water header tank & filling the freshwater pressure tank. The peak, starting just before five o'clock, is the effect of the main engine's 24V generator kicking in, from when I ran up the main engine. From six or so onwards is various lights and the telly drawing power down. A pretty windy night helps keep the voltage over the green line. Anything over the green line is good, as the battery refresher kicks in at that point. As a matter of interest, I've also shown a chart of the wind speeds for the same timeframe, taken from the Sotonmet website. The clue as to the function of the red line on the monitor screen is shown in the panel on the left of the screen. The idea is when the voltage drops below this line, the generator is automatically started & run for a time. It's set artificially high purely for testing purposes. And yes, before you ask, there will be a 'sleep' function - so the generator does not suddenly start at an unsociable time. So far, I've managed to show the oil light correctly, turn on the fuel pump etc. (sort of the ignition) and run the starter motor from the PC. The problem is, I've not been able to do this properly, or in sequence, for a variety of reasons I've still to iron out. The biggest issue, so far, is that I started the starter motor running with the PC, but then it wouldn't turn off without me pulling the wire out at the generator (after a short sprint). I suspect I might need a tougher relay to handle the high current there before I try that again. 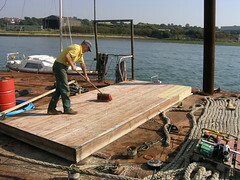 Here Fred diligently sweeps the platform, in preparation for painting. All the platform will need after painting is a set of wooden skids, to help launch the thing. The skids should also make subsequent recovery so much easier than the last time. Another of the before and after pictures I'm so fond of. 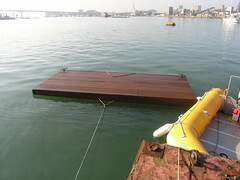 The top image shows the platform after the corner was crushed by the Humber Star. 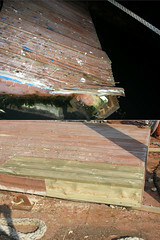 The bottom shows it after the new woodwork was completed last weekend. I know it's taken months to get this done, but the weather and all sorts of factors has caused no end of delays. Now though, I'll be able to fetch water and work alongside again. I'm pleasantly surprised at how well the repair has turned out - far better than I'd expected. 3) Count the supervising adults. How can someone, as skipper of a boat and therefore responsible for so many kids, be so careless? Another boater noted they didn't even have a dingy on board. The what if's don't even bear thinking about. 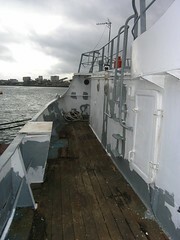 The picture you are looking at is of the bulkhead up in the forepeak, looking back down towards the stern of Lady Jane. 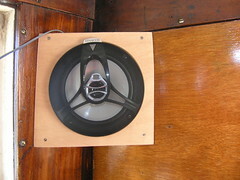 The inside view of the deck plug-in point now installed on the boat. The point of the picture is the cable tray, and accompanying cable. If it was not for Andy keeping me honest, I would simply have left the cable dangling, or maybe cable-tied to whatever was handy at best. One of the 'I'll do it later' jobs I'm so good at. I know it all needs painting, but that is just the icing on top of a solid cabling job there. What a gorgeous weekend all round. 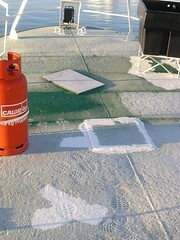 There's no better weather than warm sunshine, with no wind, to slap on a bit of paint. On Saturday, between Fred and myself, we took maximum opportunity to splash it all about. Most ended up on the boat, and slightly more on Fred than on me (sorry Jenny). A slight lapse in concentration lead to me causing more primer to be mixed than was intended. It all worked out well though, as there's never any shortage of things to paint. 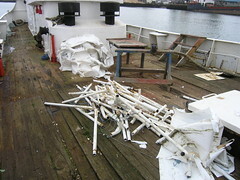 Oh, and that wine bottle you can just see on the deck there had nothing to do with my lapse of concentration. That was rescued from the river earlier. As many of you regular readers will know, I spend a lot of time fussing about my battery bank. With good reason I justify, it's my primary source of power on board. I often, almost obsessively, check the voltage on the battery bank. 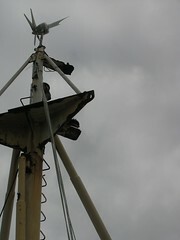 To see how it's doing given the amount of wind, or which devices are running. Recently, I came up with the idea of creating myself a monitor, where I could automatically track the batteries voltages over time on a PC. The image you can see is the result. The green line, at 25.6 volts is when the battery refresher starts working on my bank, so it's good to be above that. I am quite surprised at the voltage trace over the course of a day. I had no idea that's what was actually happening to the battery. The initial slow downward curve, with some troughs, is the battery coming down from a full charge from the previous evening, while powering the (90W) monitoring PC. The periodic troughs you see there is the fridge kicking in. The peaks you see are from running the generator for various tasks on board during the day. You can also see there was a bit of wind about during the afternoon there, not much, which helped the overall voltage situation. All the jagged stuff after 16.00 is made by the heating system producing hot water for my shower later, along with the fridge at the beginning there. The very last trough is the shower room light at about 18.30 or so. All very fascinating. Well fascinating to me anyway. Last week, when I finally got on board Lady Jane, I saw all sorts of activity and lights on Arthur, who was moored astern of me. Such activity is extremely unusual. In all the time I've been on the Itchen I've never seen anyone on Arthur. 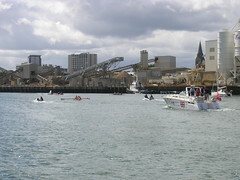 Arthur, an ex MTB or similar, is the blue hulled boat in the middle there. 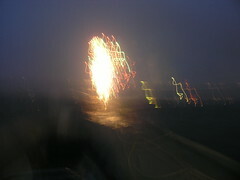 The picture was taken quite late in the evening, hence the shakiness. Some time later I heard the sound of engines running - it could have been one, or more, of Arthur's engines, or a big generator on the green hulled boat next to Arthur. I'm told that Arthur has four powerful engines, which must have made it a pretty swift boat in it's time. 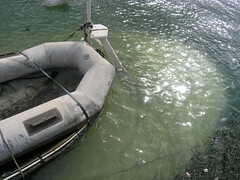 Anyway, the next morning both the green hulled boat and Arthur were gone. About the only thing I ever use the microwave on board for is popcorn, which I REALLY enjoy. For some reason, could be my lack of patience, the small generator does not seem to have enough puff to drive the microwave. For all kinds or reasons, in the past it's been too much effort to crank up the microwave using power from the big generator. Now though, with Andy's help, I have a 16 amp (easily upgraded to 32 amp) mains input plumbed into the forward bulkhead, under the whaleback. Now either of the generators I have, or shore power for that matter, can be plugged directly into Lady Jane's mains power supply via the switch we installed some time ago. The really key thing here is no more extension leads trailing through closed, supposedly watertight, steel doors. 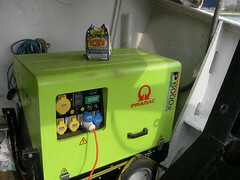 Now it's a doddle to plug in the big generator and have sufficient power at the socket where the microwave sits. It seems such a small thing, I know, but it's hugely significant. Needless to say, this momentous occasion was celebrated with a freshly microwaved bag of popcorn. It looks worse than it actually is, but even so the job of wiring in a mains plug for the fridge caused more than it's fair share of mayhem. Another case of two steps forward, one step back. 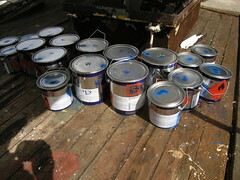 Here you see an array of tins of two pack epoxy primer from the nice people at Hempel. For those of you who are using single pack paints like Hammerite, two pack epoxys are worth looking into. Both for the quality of the finished job and for the price you end up paying. I personally prefer Hempel, but Jotun and International also do good stuff. I know Seb swears by International paints. I'm using the smaller 5 litre tins, as it's a little easier for me to work with than the big 20 litre tins. You can see I've sprayed each of the tins with blue paint, to denote primer. A quick, easy way of avoiding mixing some other type of hardener, or thinner, with the primer. You can also see letters stencilled on the big tins, to easily identify which colour is which. The idea is to use a first coat of red, then grey and finally a coat of white primer. This way I know exactly what has been painted and how many coats it's had. 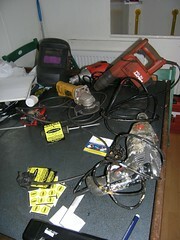 As time marches on, so I've been buying more and more tools and equipment to get the job done. Some of it pretty expensive. As a result, when I'm away from Lady Jane I've been getting increasingly worried about being broken into, and having my tools and stuff stolen. Which is why I finally got around to buying a Smartwater kit. It acts as a powerful deterrent. As evidenced by the warning signs you can see, which are now on all Lady Jane's doors. I am more likely to get anything stolen back, because of the security coding which is unique to me. It's likely to result in the conviction of any thief, or handler, caught with my stuff. It should mean some kind of reduction on my insurance. I had blogged about Smartwater back in February 2005 but, if I remember correctly, it was quite expensive then. Now it's only fourty odd quid per year, so well worth it in my opinion. It's been interesting work gathering all my bits & pieces for dabbing. Most stuff is now done, and certainly all the good stuff is well marked. The recent foul weather gives me the opportunity to catch up on internal tasks. 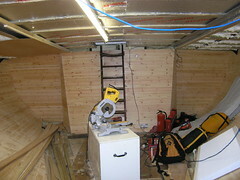 At last, I've made a start on building on all Andy's good work on the electrics. Amongst so much other preparation, the key thing Andy had done on his last visit was to setup a proper mains electric distribution board. Now, for the first time ever, I have mains sockets properly wired into where they are most needed inside Lady Jane. 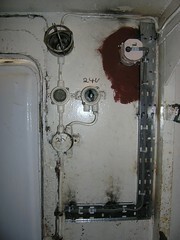 The picture shows a socket being installed in the wheelhouse. The actual connections are pretty straightforward, following Andy's example. 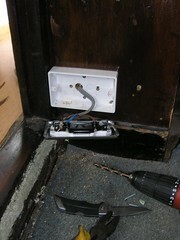 The hard part is getting the mains cables neatly through the various nooks and crannies set aside for that very purpose. Obviously this is all very much a work in progress, until it can be checked over by someone properly qualified. Those sockets make the place so much safer for everyone, certainly when compared to the extension leads I had snaking about the place. 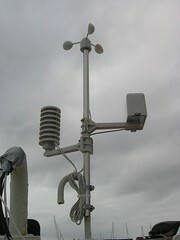 I got this idea in my head, mainly prompted by the wind generator, to get a weather station. Now I can tell wind speed, rainfall, temperature inside & out, humidity inside & out, and therefore wind chill and dew point (whatever that is). I suspect the rain gage is not working, though it may just be a faulty connection. My original thinking being I could tell the wind speed, and therefore see if the wind generator was doing what it was supposed to be doing. Which it is by the way. Actually it's been quite fascinating having this new toy. Mostly I'm surprised at the humidity readings it's been producing. They are much higher than I would have expected. That's the first time I've actually paid attention to humidity, as now I have some means of measuring it. The other morning it was sitting on a very soggy 88%. 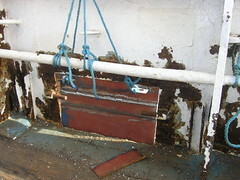 The scuppers on Lady Jane's starboard side have been in poor shape since before I bought her. It's time do something about it, before they fall off on their own accord. The picture shows one of the scuppers after it's been cut off and turned around, to reveal how bad things really are. The tape marks you can see, if you look closely, cover holes rusted through the plate there. It should not be too hard to fabricate new ones, but for some reason it's been a big mental challenge for me to actually make that initial cut. Once the job is complete, it should mean the end of those ugly rust streaks down the paintwork as well. Rust on Lady Jane is, I suppose, the equivalent of weeds to a gardener. A constant battle to keep the patches at bay. One thing I do know, is that if you don't get all of the rust completely cleaned off before priming & painting, you are going to have a problem with that rust showing through again before too long. The other thing is, as Seb says on his blog, the paint is thinnest on the sharp edges, such as corners of the steel, so the moisture can work it's way to the steel through there and therefore the inevitable rust starts showing through. It seems that no matter how thorough the surface preparation, the rust eventually finds its way through somewhere, somehow. Still, the touching up of the patches has been nothing like the Herculean effort required to get rid of the rust in the first place. It would be good to have more reliable weather, so I can get this stuff done and Lady Jane looking smart again. It's been so wet and/or miserable most weekends recently. Bank holiday weekends generally mean the river is busier than usual. Even with the poor weather we have been having, this last holiday weekend was no exception. One odd thing though, I looked out of the wheelhouse window at about eight in the morning on Saturday, to see two people swimming in the river right by the side of one of the working quays opposite me. Neither looked particularly distressed, but it's an odd place for people to be swimming. It must also have been pretty cold in the water there. 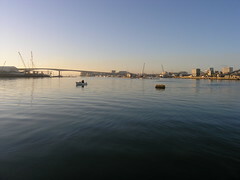 Once the second swimmer got out of the water I saw he was fully clothed, so I assume he had fallen in the water in the marina further up and was swept down river by the current. I'm guessing his swimming companion, who was wearing only trunks, must have stripped off and jumped in after him to save him. Every time I see this boat I have to laugh. 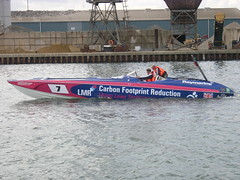 Carbon footprint reduction - on a powerboat like this? At a consumption rate of 60-70 gallons per hour, these things cannot be called economical by any stretch of the imagination. I would think that if they were that serious about reducing their carbon footprint, they would race sailboats. John, the skipper, dropped off this very comfy chair over the weekend. A bit of a hint, as the wheelhouse has no seating for the skipper at the moment. It's a huge chair, by any standards, and would be perfect for the job. Trouble is, it won't get through either the doorway or the hatchway to the wheelhouse. 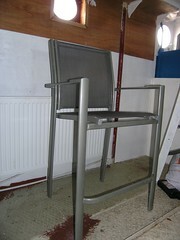 My first plan was to take the seat and back and use these on a newly constructed wooden chair that would fit. After giving it some thought, I'm tending towards cutting the chair in half at the front and back, then bolting splints to either side of the cut. 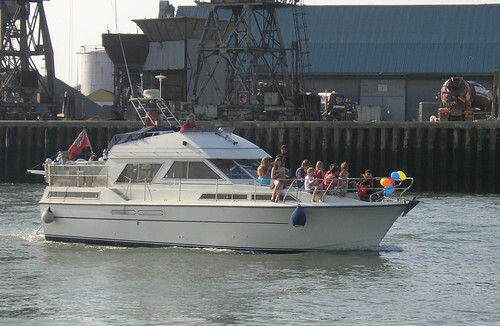 Either way, it's clear that John is in for a more comfortable ride next time he skippers Lady Jane. A huge fireworks display marks the end of Cowes week. In perfect viewing weather. Patch and I were fortunate enough to get to go watch in the relative comfort of a friends Yacht. This is not the actual fireworks, but a fireworks picture I took earlier in the year, as I've too many blurry firework pictures already. We then motored around to Osbourne Bay, in the Solent, where we spent the night. It's so hard for me not to peer, somewhat furtively, at how all the cupboards and seats etc. all fit so neatly into what is a relatively small space in their yacht. Prgress in the stern accommodation space has been slow. 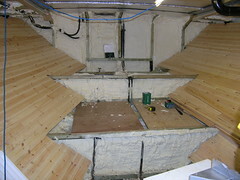 Here you see the cable trays have gone in, one down each side on the deckhead. These will carry any of the necessary data and electric cables down there. 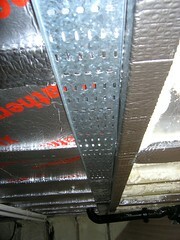 Some 2*4 up there to define the channel, then the ceiling should be able to go up. I thought I'd have a go at making myself a griddle for the barbeque. It's been on my mind to give this a go for some time now. After all I have all that steel plate on board, so why not? I'm pleased to report that initial testing indicates a success.